That thing there? It’s the graphic representation of a book! You should read books! 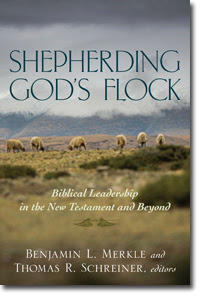 Shepherding God’s Flock is a hard book to classify. It’s densely-packed with theology and history. At times, it reads like more like a textbook than a professional development resource. Overall, the eleven contributors build somewhat on each other’s work, but each chapter can also stand alone. In summary, this book addresses the theological development of church leadership. This includes historical factors, keeping in mind that “history” often falls as part of “theology” in the Christian academic world. History tells us how God worked, after all, so the two are connected. The method of construction for this book is that various scholars wrote about church leadership from their particular strength point. Therefore one gets James Hamilton’s view of how Old Testament and Synagogue imprints carried into church leadership and Michael A.G. Haykin deals with the Apostolic Fathers until the solidification of the Papacy. That is certainly a strength. And as a Baptist myself, I do not find a problem with the Baptist-flavored viewpoint of each chapter. If you are a convictional Presbyterian, reading Shepherding God’s Flock will help you better understand the Baptist viewpoint and hopefully challenge your thinking. Further, while I the depth and density of the work has been a good challenge to my reading, I would definitely put this more in the “textbook” category. The focused attention it takes to make sense of it all might be a challenge for a harried, distracted active minister. It would be of value, but it might not be accessible enough for him. In all, as a training and development tool, this is a valuable addition to the shelf. AND IT HAS FOOTNOTES! YAY! I did receive a copy of this book from Kregel Academic in exchange for the review. Read a sample chapter here.